The American Dental Association recommends brushing your teeth 2 times a day for 2 minutes. This helps prevent build up of plaque and tarter on your teeth. Replacing your brush every couple of months or when you notice it starting to fray is part of a healthy routine. Common mistakes when brushing your teeth can be brushing too hard which can be irritating to the gums and can even wear away at the enamel which protects your teeth. Using a soft bristled brush and brushing in circular motion instead of back and forth can help prevent damage while brushing your teeth. Electric toothbrushes are useful if you brush too hard because most have sensors and will let you know when you are applying too much pressure! Power brushes are available at our dental office for purchase or at most of your favorite retailers. Only about 30% of American reports flossing daily! This means that way more than half of Americans are missing 35% of their tooth surface every time they brush. Flossing is crucial in fighting tooth decay and still many people skip this step. Flossing daily removes and plaque and tarter from between the teeth which can lead to tooth decay and gum disease. Wind 18″ of floss around the middle fingers. Pinch the floss between the thumbs and index fingers, leaving one to two inches in between. Thoroughly clean each tooth with a clean section of floss. Gently guide the floss between the teeth, hugging the side of the tooth surface in a “C” shape to make sure the entire interdental space is cleaned. Floss should not be “snapped” into the gums. Slide the floss up and down against tooth surface and under gumline. Real life tip… You don’t like flossing your teeth or heard you don’t need to? Get a Waterpik. It sprays between those teeth to remove what you’ve left behind when brushing. Mouthwash may seem redundant to some people. Why would I rinse my teeth right after I have already cleaned them? The truth is that your teeth account for less than half of the surface area in your mouth. This leaves plenty of other surfaces for harmful bacteria to live and grow. Rinsing your entire mouth with an antimicrobial mouthwash kills these bacteria, resulting in not only a cleaner mouth but also fresher breath. The bacterium that is left on the tongue and other parts of the mouth is the biggest reason for bad breath even among avid brushers. Real life tip… Harsh alcohols hurt when you swish? Try an alcohol-free rinse like Act or Crest Pro Health. Get the fresh feeling without the burn! This is one step that most people don’t even think of. If you are on the go and unable to brush your teeth directly after eating, such as on a quick lunch break at work, or a long car ride, chewing sugarless gum can help protect your teeth. Chewing helps to stimulate saliva production which breaks down bacteria in your mouth. Gum also helps to remove food particles stuck in your teeth after eating which helps with bad breath throughout the rest of your afternoon. Real life tip… Xylitol gums and mints are becoming very popular! Shark Tank inventors created Ice Chips which help eliminate bacteria from your mouth and tastes delicious. These are 4 easy steps to include in your daily routine. You might already be doing some of them which is great! 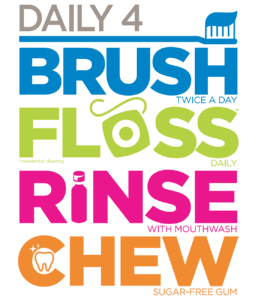 Remember that all FOUR of these have a different result and benefit for your oral health! 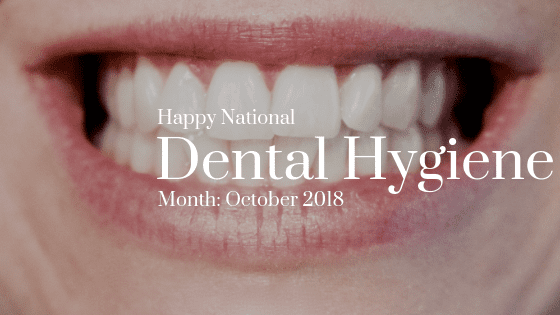 If you have questions or just remembered you needed to schedule your regular hygiene appointment, feel free to call us!